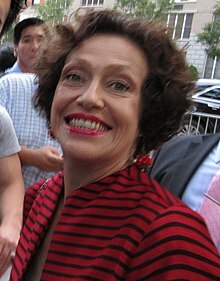 Karin Konoval (/ˈkɒnəvəl/; born c. 1961) is Canadian-American actress who has appeared in guest starring roles in numerous TV series and supporting lead roles in many feature films. Her screen credits include Maurice the Orangutan in Rise of the Planet of the Apes, Dawn of the Planet of the Apes, and War for the Planet of the Apes; three X-Files episodes: "Clyde Bruckman's Final Repose", "Home", and "Plus One"; and the lead role of Mary Leonard in Cable Beach. Konoval was born in Baltimore, Maryland, but raised in Canada in Edmonton, Alberta. She relocated to Vancouver to attend theatre school in 1981. 1998 The Outer Limits Sarah episode: "Lithia"
^ a b Conner, Shawn (August 1, 2017). "Vancouver actor Karin Konoval learns from orangutans for her Planet of the Apes role". Inside Vancouver. Archived from the original on January 29, 2019. This page was last edited on 30 January 2019, at 02:56 (UTC).